After months of admiring and waiting, I finally splurged and bought the boys a set of clear Magna-Tiles. They will likely spend a lot of time on the light table, but I foresee hours of building and constructing with the Magna-Tiles off of the light table too. 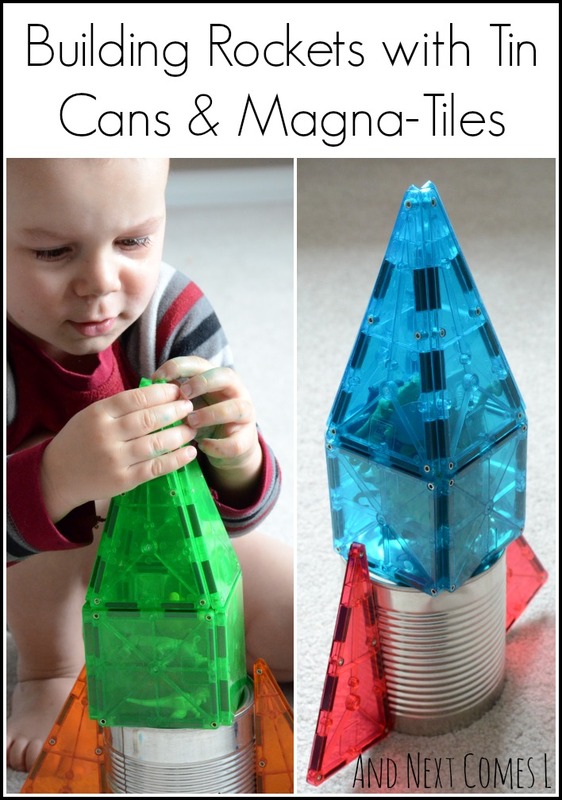 Here's a fun boredom buster for kids using Magna-Tiles: let them build rockets! The rockets that we made using the Magna-Tiles are certainly indicative of the hours of enjoyment that they will bring. The boys literally spent three, almost four, hours building and playing with these homemade tin can rockets the first afternoon. Then another couple of hours the next day. It all started when J discovered that the Magna-Tiles would stick to a tin can that we had leftover from another activity. Then he slowly built a rocket. Well, then K had to build a rocket of his own with some assistance from me. He looks pretty pleased, don't you think? J then decided that the rockets needed some passengers. So he ran downstairs, grabbed our bin filled with figurines, and happily brought it upstairs. He carefully opened one of the rocket's "doors" and loaded in a big random assortment of creatures or "lots of peoples," as he explained. Then naturally we had to make the rockets blast off, complete with a full countdown! The magna tiles look very cool, thanks for sharing at our FB Share Day! Well, thank you for visiting and commenting!